Looking up local brewpubs on RateBeer gave me the start: there were several listed and mapped, none of them especially near the Hauptbahnhof, but hey, it was a nice day for a walk. My first target was Päffgen which was a lovely old place but a bit confusing. The entrance corridor is also the busy service area supplying the waiters from the kitchen, so for a moment you wonder if you've accidentally gone in the wrong door. I'd read that you may need to share a table, but when I tried to do just that in the salon, the waiter told me all the tables there were booked (for a group, I think he said). Fortunately the glassed-over yard at the back had plenty of room, and it didn't take too long to get the waiter's attention and order - what else? There isn't anything! - a Päffgen Kölsch. Kölsch is a top-fermented (obergärig in German) and warm-fermented (15-20C, versus 5-9C for bottom-fermenting) style, like British ales - though with its own ingredient list, of course. The other difference is that, after fermentation, Kölsch is lagered, ie. matured in tanks in a cold cellar before casking. Next on my route was Hellers but to my considerable surprise it was closed! I later discovered it doesn't open until 5pm, which might make a certain sense on weekdays, but not on a Saturday, surely? Again, it didn't take too long to catch a waiter's attention, and the next time a Kranz passed by it delivered me a Stange. This too was good - a nice balance of hops and malt, with a dry and hoppy finish. Not quite as good as the Pfaffen perhaps, but certainly good enough to stay for a second! Waiting for my lift when I got off the train, I had an idea: there was a supermarket over the road, and given its location near Cologne it was bound to stock Kölsch. 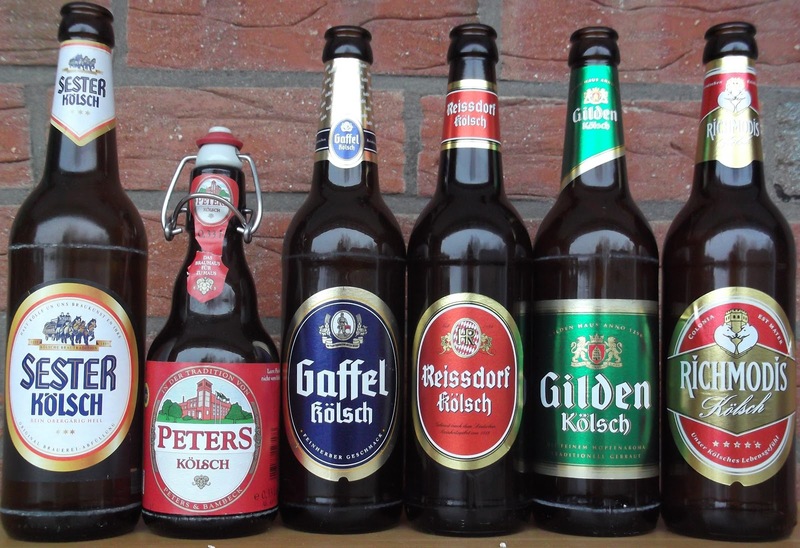 (The German beer market is rather local - a shop near Cologne might have five or six Kölsches, whereas one outside that area might have none or maybe Früh, which seems to be the most widely distributed.) Sure enough, it had a couple I'd not seen before - and then when my wonderful wife turned up with the car, she'd been shopping too and found me four more I'd not tried before! 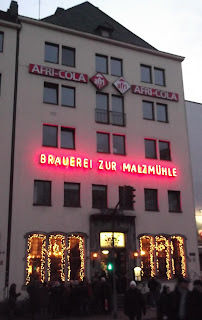 So I was able to spend the following week or so tasting different Kölsch beers - and it was an interesting experience. Kölsch has a certain legendary status among beer-buffs as one of the few remaining old German ale styles - those beers that survived the 19th century onslaught of bottom-fermented lager and then the 19th-20th century massacre perpetrated by Pilsner. Anyway, some of these were rather nice - the Peters especially, plus the Gaffel and the Richmodis (not surprisingly, as it's also a Gaffel brand - brewery closures and consolidations happened here too). But while the other three were OK, I might as well have been drinking Pils - I found little that was distinctively Kölsch about them. It's almost as if the breweries had said, "Well, we've got this traditional name that everyone's very proud of, but Pils is the big seller. Why don't we knock all the flavour out and Pilsify it, then the Pils drinkers might buy it." So sad, it really is - and how lucky I was to start this particular set with one of the best! PS. Via a helpful comment (below) I subsequently learnt that Kölsch brewing had pretty much died out by WW2, and was only revived by a concerted effort in the 1950s. Most, if not all, of the local breweries had gone over to the likes of Pils and Weizen by that time, which would explain the character of modern Kölsch. Certainly, medieval Kölsch would have been significantly different from the modern version - it would not have been crystal-clear and golden, for a start. There's a load of Kölsch history on the Kölner Brauerei Verband website (all in German, mind you! ), I've had a dig through but I can't yet find any descriptions of medieval Kölsch bar a reference to "good brown beer" or somesuch. Can you remember which one it was? 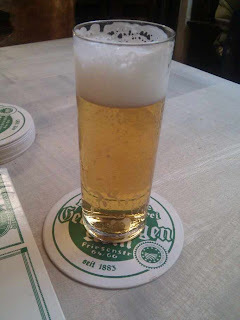 "Kölsch is top-fermented (obergärig in German) and warm-fermented style, like British ales." Well, except for the use of different yeast, different malt and different hops, maybe. It’s a more interesting comparison to say that like British ales, it’s naturally conditioned and (in the brewery taps, at least) served without extraneous gas – and, as you discovered, often isn’t very good in the bottle. Kölsch in its modern form isn’t any older than Pils, by the way. 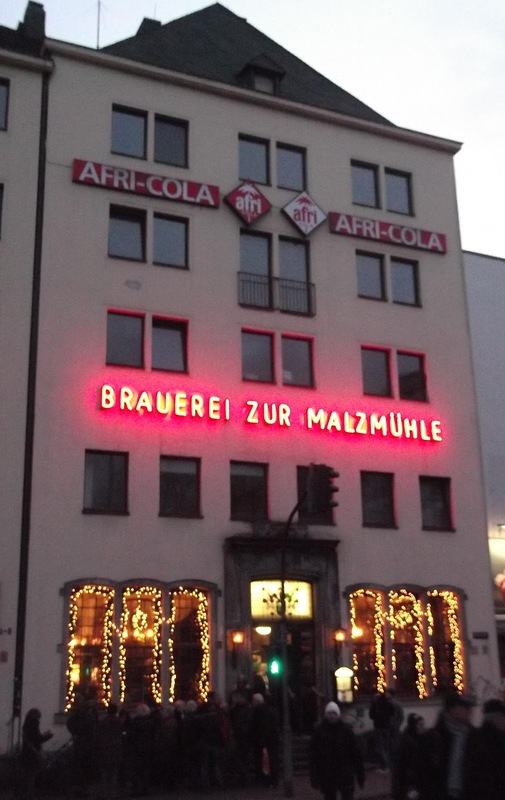 Most of Cologne’s breweries had switched to bottom-fermentation before in the 1960s and 1970s an extraordinary effort to revive Kölsch brought it back to dominance. By the look of it, Pilsner and other lagers had already swept in pre-WW2, and many of the old breweries had gone over to Pils, then after the war when brewing restarted it was with yeast donated by Carlsberg. Then in 1951 came the idea of reviving Kölsch, but some breweries still resisted and it took a decade or two to get most of them on-board. But if they went to Pils first, and only then came back to Kölsch, that could go a long way to explaining the character of modern Kölsch. Is that craft beer - or merely crafty beer?